The mast poles have finally arrived and re-shapping then has begun. I must admit I’m a little daunted at the size and weight of these poles as well as the task at hand to thin them down to the required dimensions. I’ve been using the technique outlines by Derek van Loan using a circular saw to cut to the required depths and then removing the excess wood with hatchet and chisel. I think it’s going to take me longer that the few days I first anticipated as progress is slow, and now inclement weather has a put a halt to the works. 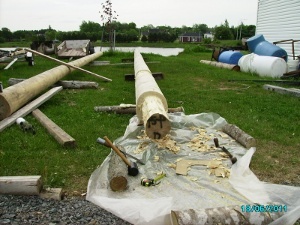 Back in Charlottetown I have removed the central fuel tank to make room for the main mast. 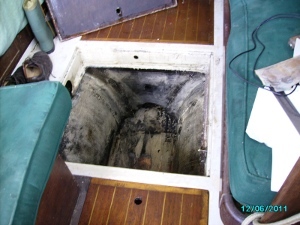 It will be stepped almost to the bottom of the bilge just a inch above where the ballast starts. I’m leaving a gap so the bottom of the mast will be able to breath as well as allow any water to flow to the deep bilge below the engine. This entry was posted in alberg 37, masts and tagged alberg 37, bilge, junk rig, masts. Bookmark the permalink.